Sweet and Sour Chicken made healthy with low fodmap, paleo ingredients free of additives and full of flavor. Did you know that it can take up 6 weeks to get over a gluten contamination? Blah. A couple of weeks ago we had Chinese takeaway (including a killer sweet and sour chicken dish) for the last time for my father-in-laws birthday. We had eaten from this place a couple times before with no major issues that we could remember. I say for the last time because lo and behold – Mike got glutened. <–(that may or may not be a made up word). The day after our meal Mike broke out in a rash that he used to randomly get before being diagnosed with Coeliac Disease. Along with the return of the rash came a return of his old deep muscle aches and a number of other symptoms that used to be written off as side effects of having ME/Chronic Fatigue. The thing about healing from Coeliac disease is that a lot of the time it feels like you take 2 steps forward, and 17 steps back. Unless you take food matters into your own hands you leave yourself wide open to cross contamination and further gut damage. Knowing how to cook your own food isn’t just a valuable skill, but a necessity. Basically everything above is just a really long and round about way to say that you should definitely try your hand at making your own food from scratch. The good news – you can make healthier versions of pretty much anything, and you can even make it ten times better. *Hint* The secret ingredient is love….or salt….whichever. Seriously though, this sweet and sour chicken tastes identical to ones I have ordered in from takeouts and I guarantee it’s a hell of a lot healthier than anything I’d pay for. It took me a few goes to make it right – the first few sauces really took on the sour in sweet and sour. Just…no. I know I nailed this one in the end though because after Mike finished he plate he announced that instead of a cake for his birthday next month, he wants me to recreate his favorite Chinese takeout dishes including this recipe, my Whole 30 Cashew chicken, and a few others. I adapted this recipe from the Sweet and Sour Chicken recipe from DamnDelicious to make it Paleo friendly and low FODMAP. I used the Low FODMAP ketchup that I made last week, but you can totally use your own store bought if that’s easier for you. I also used arrowroot starch to batter the chicken, but you can use cornstarch as a cheaper alternative that works just as well. No need to order out with this Sweet and Sour Chicken takeout fake out in all it’s sticky glory. What’s your favourite takeout dish? 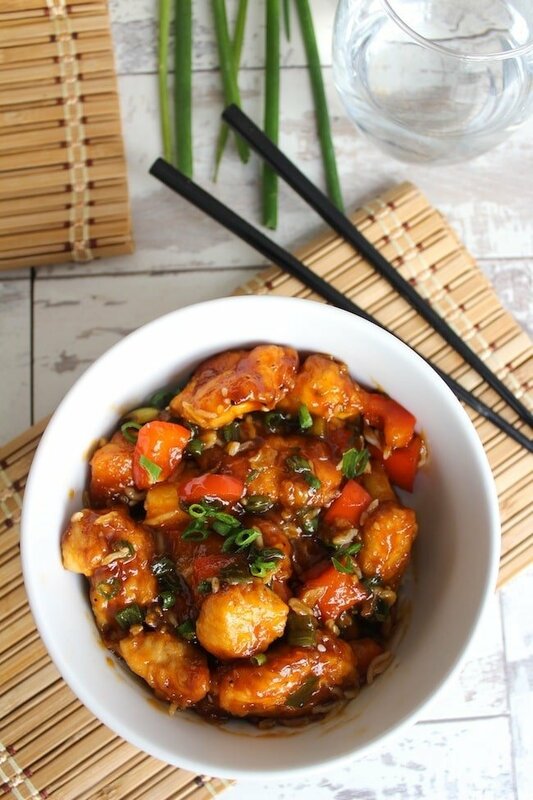 Don’t forget to tag @asaucykitchen if you try this Sweet and Sour Chicken! You can also post your pictures to my facebook page! First prepare the sauce by adding the coconut sugar, vinegar, coconut aminos, chicken stock and ketchup to a medium sauce pan. Stir and bring to a boil. Reduce to a low heat and leave until later. Add chicken pieces and beaten egg to a large ziplock bag. Seal and shake to coat chicken. Then add the arrowroot starch to the bag, shaking again to lightly coat all the chicken pieces. Add coconut oil to a large non skillet. Add the coated chicken. Fry over medium heat, a couple of minutes on each side until the coating begins to crisp. Add pepper and pineapple chunks. Continue to saute over medium heat until chicken is browned and cooked through. Add the sauce to chicken and peppers. Cover and reduce the heat down to a simmer and allow the juices to soak into the chicken for a few minutes. Top with sliced green onions. Serve over rice and enjoy! I recommend making your own chicken stock for low FODMAP or using this FODMAP friendly vegetable stock. Thanks Belot! Glad you guys enjoyed it! I am just starting on a low FODMAP diet to see if I can get some relief from my IBS. The list my doctor gave me of foods to avoid includes coconut, so I was surprised to see this recipe includes coconut oil and coconut sugar. Hi Christa! The tricky thing with this diet is that not everyone is triggered by the same food. Many people on low FODMAP diets can tolerate coconut in small/limited amounts. When I first made this recipe several years ago coconut wasn’t one that was recommended to avoid. Even now it’s one that can still be used sometimes. Ultimately though you should listen to your doctor about what’s best for you! When I cook food from a recipe it most of the time doesn’t turn out how I expect, however this sweet and sour chicken that I made seemed to be better than the one I buy. Its an easy recipe to follow and the outcome is excellent. Thanks Kams! That makes me so happy to hear! Another great recipe! Thanks so much! DH and I both like this recipe. He’s not following a LF diet like me, so it means a lot to find a recipe that we both think is tasty. I love that you have so many recipes for people like me: low fodmap, gluten-, and dairy-free. Thanks Danielle! So glad that you both like it! What are those little white seeds in the pictures? Hi Marie – those are sesame seeds! This was deeeelicious. I made one batch with super firm tofu (low fodmap) for my boyfriend and one with cauliflower florets (not low fodmap, but I love cauliflower – especially prepared this way, tasted like fried cauliflower but made with very little oil). It all came out looking like the pictures and tasting great and not taking as long as I thought it would. The amount of sauce for 1lb tofu was perfect, with a little extra dripping off everything – and since it was so flavorful, I could actually have done with less sauce. I used about half of a medium head of cauliflower for the other batch and there was plenty of sauce for that too, even though the cauliflower had more nooks and crannies to hold sauce in. Next time when I make this I will pair it with sauteed garlic kale for a nice color and flavor combo. Definitely need plain rice to offset the flavor punch of the sweet and sour sauce. Unfortunately my boyfriend had GI symptoms even though it was low fodmap – can’t tell if it was the tofu or the ketchup or the apple cider vinegar … we’re still learning about fodmap. Aww yay! I’m so happy to hear that! Loving your idea for using cauliflower – I’m totally going to try that! Thanks Lil! Can you tell me what the * by the apple cider vinegar is for? I can’t find a corresponding reference on the page? Hi Pauline! It’s in the first line of instructions after the coconut sugar 🙂 Hope you like it! Let me know if you have any more questions! This is the best recipe I have ever used online! amazing!! thank you so so much – identical to a takeaway! One of the best FODMAP recipes ever!! It was a huge hit! I made this for my wife last week and unfortunately it was a huge hit and I’m making it again tonight. I don’t eat meat so for me I replace the dead bird with Quorn chunks and homemade veg stock then make everything twice. No idea if you can get Quorn outside Blighty but I think it’s low FODMAP, freezes well and tastes great. A scrummy veggie option if you can get/eat Quorn? Ha! Glad your wife liked it! I’ve seen Quorn in my local supermarket so that’s good to know that it worked for you! As for other low fodmap meat substitutes – I’m pretty sure tempah is also considered to be low fodmap since it’s fermented. Sorry you felt that way! I recently found it that I’m allergic to eggs. Is there anything I can use as a substitute in this recipe? Hi Brittany! I’ve had a people people make this by using using milk ingredient of eggs (that can be dairy of dairy free milk)! You just need 2-3 tablespoons in place of the egg and that’s it. Hope you like it! Thanks Georgie! Hope you like it! I just made this last night and it was SOO good. I’m from California and am here in England with a grumpy, fast food obsessed 15 year old who is not so happy about our new healthy eating plan. I made this chicken and he said it was better than Panda Express – which seeing as Panda Express is his favorite place is really saying something! And I was so happy to eat this without the major stomach issues I would usually have from sweet and sour chicken. I also made your low fodmap ketchup and ranch dressing and they were both delicious too – now I’m just going to work my way through all your recipes – thank you! Aww I’m so happy to hear that you all enjoyed it! As another US expat living in the UK I totally feel your son’s pain! I hope you like everything else you try just as much! The recipe looks great! If you are trying to do both low fodmap and Whole30, do you think it would be possible to leave the sugar out? Would it change the taste too much? Hi Emily! I do think that leaving out the sweetener would make a pretty big difference – the vinegar needs to be toned down by something or it will be all sour and no sweet. Awesome! Thanks for coming back to let me know what you thought! How much honey did you use? Attention though, low fodmappers: honey contains a lot of fructose which unfortunately is not fodmap friendly…. Thank you so much for coming back to let me know what you thought – hearing that totally makes my day! I made this last week and plan to make it for company next week. It is SOOOOOO GOOD! My husband raved about it. Sometimes this LOW FODMAP Elimination thing can be depressing. Your recipe was a real pickup for my spirits. I cook all the time and I’ve never made chicken more tender than this. The only modification for me was to use regular sugar. Thanks, Sarah! I’m so happy to hear that! Thanks so much for coming back to let me know!! Maybe I’m missing something, but the title states Paleo but there’s a lot of sugar in this recipe. Do you know why that is? Hi Noe! Coconut sugar is paleo so that’s what I recommend using but I also like to give people the option to use white sugar since coconut sugar isn’t as easily available for a lot of people. I also try to make my recipes accessible to as many different diets/lifestyle as possible which is why I also list different types of flours, ketchups and vinegars. I just want people to feel capable of making something for themselves. I’m not a fan of cooking but I had a guest and wanted to try something. This was AMAZING ! So simple and tastes glorious. Inspired to cook something new once a week now. Thank you! I just made this tonight and it turned out perfectly! I’m so glad I found this site! Recently started FODMAP diet but have been Whole30ish/paleo for a while. Your recipes are a great combination! So glad you liked it! I’m also glad you found my site – I hope my other recipes are as helpful! Does the 42 g of Carbs include the rice or is it just the chicken portion? Why did you claim copyright infringement on Pinterest for those who have saved your page on their recipe boards? Hi Roberta! I’m not sure what you’re talking about. I once claimed copyright infringement on a single pinterest image of mine that was being used to link to their website that had nothing to do with my recipe or food because it was misleading. I’ve never made any action against people pinning my page to their board – as someone who loves using pinterest I’d never think of doing that. Are you having problems pinning things from my site? There might be an issue on pinterests end that I can try to sort out. Oh, thanks. That might be what it was – the image. I got an email from Pinterest this morning saying that it was copyright infringement and the pin was removed. They did not say where the pin pointed to, so it may have been just the image. I’ll try repinning from your page. Thanks! Made this tonight – it was my first ever fodmap meal and it tasted amazing. Just one query – it might be just me but I didn’t understand where to use the 55g of Coconut oil! Yay! Glad you liked it! And sorry about that – should have been more clear in the instructions. The coconut oil is meant for frying though you may not actually need that much if you’re using a non stick skillet or wok. Love this sauce! Tastes just like I remember it. Yay! So glad you liked it! Thanks Meagan! I have made many different Sweet and Sour recipes over the years – and this one just nails it Its the best by far. So easy to make and its low fodmap, my kids adore it and always ask for it and it is better than the excellent take away near me. Thanks Grant – really glad you guys like it! Chicken stock has onions in it, how is this low fodmap? This is such an amazing recipe! The first one I’ve made that everyone loves and they don’t even care if it’s “from my crazy diet”! It has actually converted me to making something I would normally only eat from the takeaway but I now prefer a home cooked version! Thank you SO much. I’m off to try all the other recipes now! I made this last night and it was absolutely delicious! Better than take out and so much healthier. Thanks for sharing! I am new to the low fodmap world and not a very experienced cook. I made this sweet & sour chicken last night and it was delicious! The recipe was very easy, even for a beginner. My husband had seconds and is looking forward to polishing off the leftovers.. Can’t wait to try more of your recipes! Thank you so much for this recipe – I just made it and it was delicious! My mods: I used cornflour and chopped chicken thighs, regular sugar, soy sauce and ketchup as I can tolerate them, a bit of Swiss Veg Bouillon powder with the right amount of water instead of the chicken stock and added in yellow peppers and sliced courgettes for extra veg. It turned out perfectly! Ooh yay! So glad you liked it! Thanks for sharing your modifications too – I always love seeing what people do to make it their own and it’s super helpful for others as well! How is this low FODMAP with sugar? coconut sugar is considered safe in small amounts – as long as you’re not eating too large servings you shouldn’t get a reaction. If you’re worried it might trigger an ibs reaction you can always sub the sugar for maple syrup – just 1/4 cup and you should be good to go! I’m making this right now. I’m new to FODMAP. I eat NO meat…chicken, so how does Qourn roast fit in here? It’s all I use in place of chicken. How do you serve, over what? I have 3 prices, but they’re not FODMAP? Help!!! I meant, I have 3 prices. Balsamic, red, black. How do you serve this, on what? Hi Diana! I’m pretty unfamiliar with Quorn products so I can’t offer much guidance there if it’s a product that’s already cooked you could just make the sauce and add it to the Quorn. I usually serve this over a bed of rice with some fodmap friendly vegetables. If the Quorn isn’t low FODMAP there’s not really anything that we can do to change that – you might just have to try another meat free substitute to use in the future? Sorry I can’t be more help! I made this for dinner last night and it was amazing! Thank you for creating such a delicious dish that is so easy to make. I thought I was doing something wrong when the arrowroot starch and egg with the chicken got all sticky, but it cooked up perfectly. Definitely going to make it again and again. That’s great! SO glad you enjoyed it! Thanks for coming back to leave a comment/ review! You can use 2-3 tablespoons of milk (dairy or non dairy). I’ve done that when we’ve run out of eggs and it still works! Finally a low FODMAP dinner my daughters will eat!! It was delicious. We will definitely make again. Thank you! I loved this!! My 11-year-old daughter helped me make it, and she LOVED the food. I am so happy, as it is often challenging to find paleo-type foods that she enjoys as much as the original. She is a huge Chinese food lover, and gave this two thumbs up. Thank you!! This was so good my mom wanted it two weeks in a row and had me double the recipe! Finding delicious FODMAP friendly meals that everyone will like is challenging, especially since I’m the only one in the house who has to follow the diet. This meal was amazing and reminded me just how good the food I can eat is. Warning for those who want to go back for seconds, I wouldn’t recommend it since it is an acidic meal and would likely be too much sugar with more than one serving. Save any left over for lunch the next day. That is the best compliment I could get! I remember how difficult finding low FODMAP recipes used to be when my husband had to eat that way so I’m SO glad you found this helpful! Also – good tip on the left overs thing! I always make sure I’ve got plenty of help eating this so that I don’t go too crazy and eat too much too soon. It may be a healthier version of takeout, but any thing in excess can be a problem. Thanks so much for coming back to leave a comment/rating! Thank you thank you thank you!!! My husband is gf and lowfodmap as he is newly diagnosed with ulcerative colitis, we are struggling to find recipes we can make that he can enjoy! This one hit the mark!! I cooked my chicken in my airfryer using a little coconut oil and sprayed with an olive oil spray …it was fantastic!!! Crunchy chicken , tasty sauce!! Tasty dish overall, will be making again and again!!! That sounds so tough – I’m glad I was able to help you guys find something you both enjoyed so much! Thank you so much for leaving a comment! That’s so great! I’m glad you enjoyed it so much – thanks for coming back to leave a comment! This has been one of the best versions I have ever made. I loved that I didn’t have to use my oven and bake it for an hour. I love coconut sugar now! Thanks for this recipe!! I just made this recipe and it was delicious! I really appreciate your website and the many easy to create recipes! Thank you Sarah. I will definitely be making it again! Are there any substitutions for the chicken stock? I don’t have any homemade and almost all store bought stock is not low fodmap? Not sure exactly how I found your website, but glad I did ! Love this recipe ! I haven’t had any luck with gluten free sweet and sour sauces, but my search is over. Thanks so much, and I’ll be making this often ! I’m so glad you liked it! Thank you so much for coming back to leave a comment – they make my day! This recipes sounds amazing, but I’m on SCD. Do you know of any alternatives for arrowroot/tapioca flour/cornstarch that are SCD legal? Or what might happen if I simply leave the arrowroot out? I’m going crazy trying to find things I can actually eat. Hi Amy! I can’t think of any SCD flours that are similar to tapioca/arrowroot but you could used crushed almonds/almond flour to batter the chicken instead. Instead of adding the almond flour to the ziplock bag, coat the chicken pieces in a small bowl with the flour. Almond flour doesn’t stick as well as starches so it might be a bit too goupy otherwise. Another option would be to just skip the battering altogether if you don’t mind. Hope that helps! So glad you liked it! Thanks for coming back to leave a comment! Thanks Alina! Hope you like it! This looks delicious! I am planning on making it tonight, but is there any other way this can be prepared (possibly in the oven?) Sometimes fried food isn’t great for people with IBS; just wondering if there are any possible alternatives! I read that someone would omit the egg in a future making of the recipe. I am egg free, and it’s hard to find a good egg substitute for this type of dish. Is it safe to leave the egg out? Or is there a substitute you recommend? You could try using milk (can be dairy free milk of your choice if you need it to be). Since chicken breast can be dry the egg (or milk) is used to add a little bit of moisture to the chicken in addition to helping the starch stick. You could also just leave it out altogether and just go for a dry batter. I’ve been playing around with just battering chicken pieces in potato starch lately and I find that it still comes out great – it just has less of a coating. Could you use honey instead of sugar? Thanks! That’s fine! Honey tends to be sweeter than sugar/coconut sugar though so I recommend adding 1/4 cup honey to start with and then add more if you feel like it needs it up to the full 1/2 cup. This was delicious! I had to use tapioca starch because I guess I ran out of arrowroot, but it was delicious! My kids and husband loved it. Made it will an “egg roll in a bowl” recipe and they were tasty together! For some reason I can’t give it 5 stars? It’s definitely a 5 star recipe! Yay, thank you Sarah! So glad you guys liked it 🙂 I love the sound of an egg roll in a bowl – I’m going to look that up! I couldn’t get the chicken to crisp up at all – the egg and arrowroot mostly just turned into mush and stuck to the pan when I tried to fry it. Nevertheless I still liked it. Next time I”ll just leave out the egg & arrowroot. I also added the pineapple juice from the can of pineapple I used to the sauce. Sorry it didn’t crisp up for you, but I’m glad you still liked the flavor! Sometimes if I add to much chicken to the frying pan without leaving space in between each piece I have the mush problem as well. Another thing you could try if you were to do it again with the flour would be to make sure the oil in the pan is really hot. Thanks for stopping by and leaving a comment! Do we just omit the to keep iy paleo? Hi Kimberly – can you clarify the question? Thanks! I’m wondering if she meant to ask about the ketchup? Is there a substitute or just omit it? My homemade ketchup didn’t thicken up very much. Any suggestions? I’ve found that the longer I simmer the mixture the more it thickens up. Just make sure to keep stirring every now and then so it doesn’t burn. Another thing you could try is to add cornstarch (or arrowroot) to help thicken it. To day that add 1 tablespoon cornstarch to 1 tablespoon cold water – whisk until you get a slurry like mixture and then add the cornstarch/water combo to the ketchup and simmer until it thickens that way. Hi, Sarah! I made this last week and wanted to be sure to let you know how much we enjoyed it. I also wanted your readers to know that I used only corn starch for the chicken and it was still amazingly good. I added sesame oil to the sauce because it’s one of my favorite flavors. I’m putting this into rotation FOR SURE. Thank you! Sarah my family was complaining yesterday that we didn’t have Chinese in a while. I’m going to prepare this for lunch today. They’re going to love it! Gut issues are SO difficult! It’s great that you’re keeping an eye on that kind of thing too – better safe than sorry, ya know? I find it so interesting to learn about gut health. There are so many things that we might not necessarily think are related, but then a lot of it comes down to what we eat. Thank you, Sarah! You should try it out – it’s a really easy recipe and it tastes great! Thanks, Camilla! I hope you like it – it’s soooo easy to make you won’t believe it! 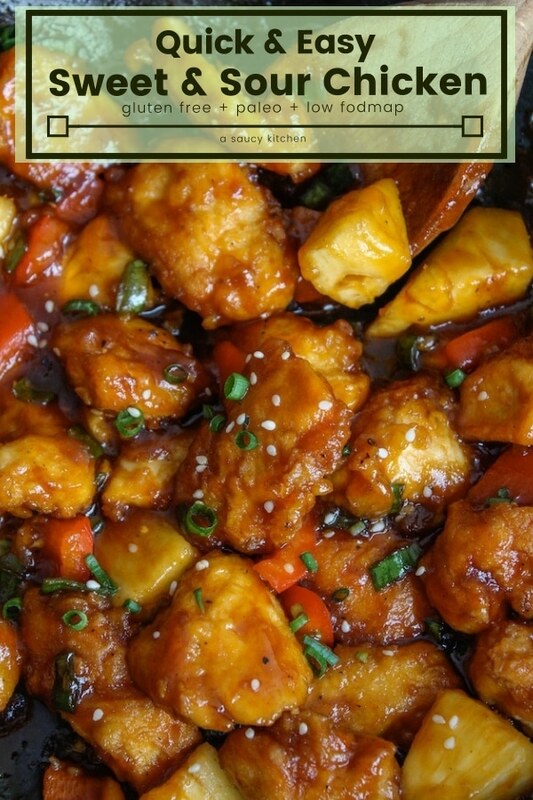 Sweet and sour has always been one of my favourite ways to eat chicken, beautiful pictures too! Thank you, Diana! Sweet and sour all the way! Oh wowza! I am in love with these pictures! 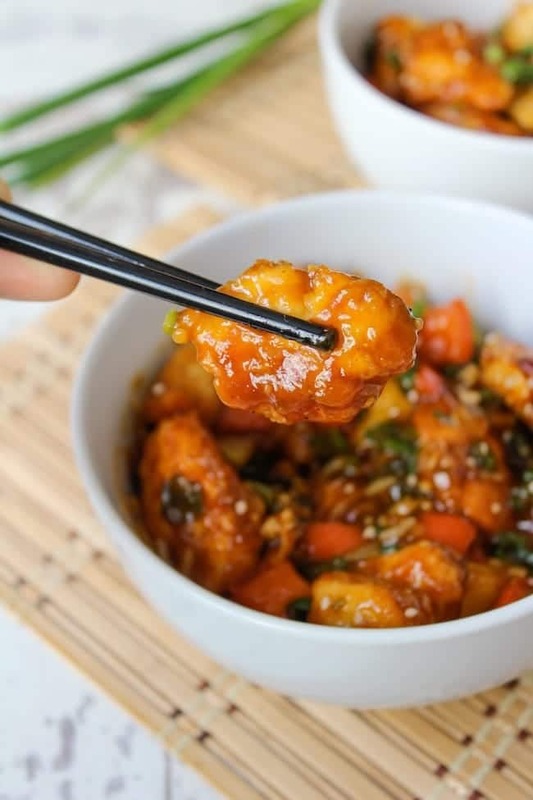 I love a good sweet and sour chicken and this recipe is definitely on my “to make” list. Thanks for sharing! No, thank you! It just had to be done – sweet and sour chicken is one of my favorites! This looks incredible! Set side-by-side, I wouldn’t be able to tell the difference between your “fake out” and Chinese takeaway. And believe me, I’ve had ALOT of sweet and sour chicken/ pork in my time. Totally one of my favourite takeout guilty pleasures! Ahh, thank’s Gabriel! And I’m so with you – sweet and sour dishes are my weakness – I just can’t get enough of it! I’m so sorry to hear about Mike getting gluten in that dish. How discouraging. Sure hope he can get back on track to feeling well quickly and that it will be quicker than anticipated. Your recipe looks absolutely amazing!!! Must try. Thanks, Allie! I think he’s starting to get over it more now which is great – a bit frustrating about not being able to eat out much, but at least it gives me an excuse to make things like this! Let me know what you think if you try it! 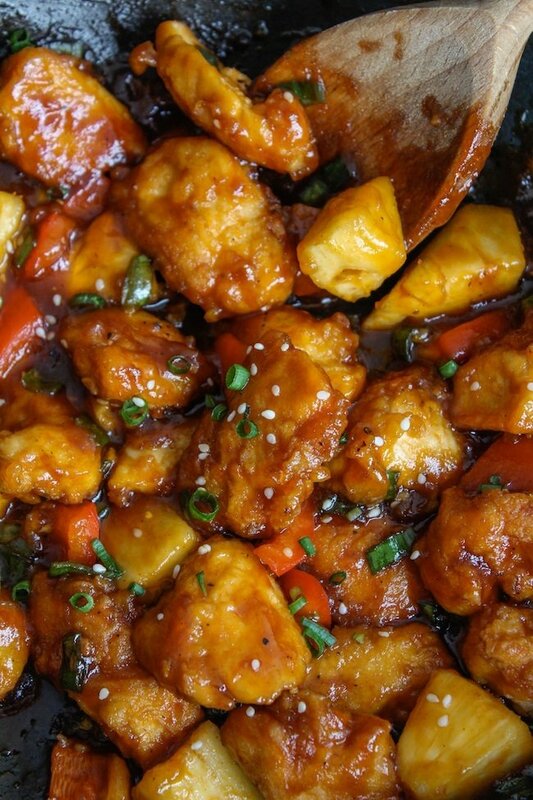 This recipe looks so perfectly sweet and sour, and just the right amount of sticky. I love how you used some healthier ingredients as your oil, sweetener and thickener. I bet the coconut adds an awesome tropical nuttiness to the dish!